A light and refreshing Spring approach to pasta + sauce. This raw dish is packed with B vitamins, fiber, protein, and enzymes! Soak sun dried tomatoes in boiling water for 5 minutes. Meanwhile, combine all ingredients but walnuts in the bowl of your food processor. When the tomatoes are done soaking, add them to the bowl with the 1 cup of soaking water. Process the tomato mixture for 2 minutes, or until smooth. Remove bowl from machine and stir in chopped walnuts. 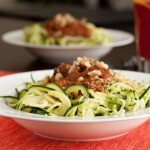 To make the pasta, cut zucchini in half vertically and use spiral slicer to make long strands. If you don’t have a spiral slicer, you can shred with a food processor or hand held grater. 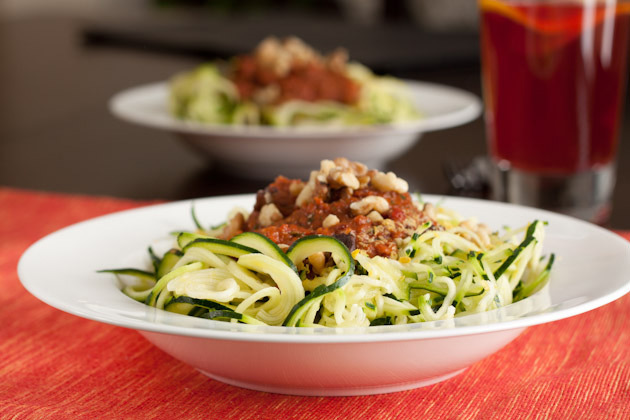 Divide zucchini among 4 plates and top with sauce + extra walnuts. You can add olive oil to this recipe, about 2 tablespoon would be good. I didn’t feel it was needed, but the option is there!